Time to go back to the future - the future of Gotham City! Not long from now, Gotham has transformed into a high-tech town, and a high-tech Batman has risen to fight the criminal element. Bruce Wayne is retired, but he mentors the new Batman and keeps him informed on old threats when they resurface. 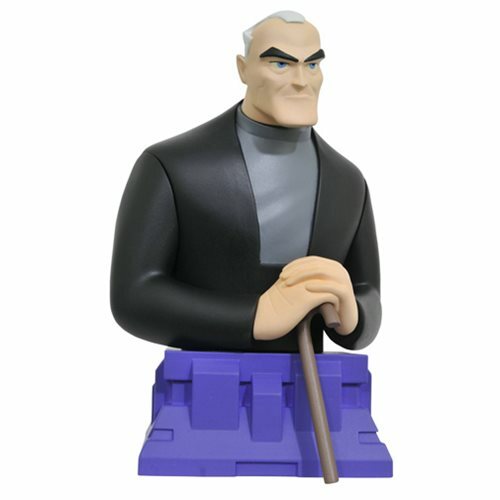 This approximately 6-inch resin bust of Bruce Wayne depicts him as he appears in Batman Beyond, and sits on top of a pedestal base inspired by the city's ultra-modern architecture. Limited to only 3,000 pieces, it comes packaged in a hand-numbered, full-color box with a certificate of authenticity. Ages 13 and up.